I want to share with you what I consider the greatest pork dish in the world. It is called sisig, and it is made by the folks at Magic Wok, a Filipino restaurant in Artesia -- a city I want to nominate as an honorary member of Orange County, simply because Magic Wok is in it. Their speciality of the house has long been the crispy pata; a whole hind leg of a pig, brined, boiled and deep-fried into a crackle raunchier than a thousand pork rinds. But last year, around the same time they recovered from a fire that nearly destroyed this preferred dining destination for Southland Filipino food lovers, Magic Wok introduced a dish, nay, a porcine opus, that bested its crispy pata on succulence. Traditionally in the old country, sisig is made with meat chipped off a pig's face, and can include some offal, even brains. One recipe I found for the dish begins with "Grill pork head to remove hair." After that, it gets even more archaic. Although Magic Wok's rendition does not involve a pig's head (that I know of), it is still a long distance away from your mama's Tuesday night pork chops. This is dish of pork for those unafraid of pork. Only true carnivores who don't cower at the thought of consuming a little, no, make that a lot of fat, should consider it for their supper. The reason? On every other spoonful of this porky hash, you will encounter a slip of quivering pig blubber, stuck to the underside of a crispy shard of skin here; next to a crunchy chunk of meat there. It will slick your lips to a glossy shine. It will make you shudder and moan in ecstasy. It will make you thank the heavens for creating this "magical, wonderful animal" for us mortals to enjoy. But the most compelling part about Magic Wok's sisig is that it is a dastardly simple dish, with little more than a few ingredients that make up its composition. They start by plunging the meat and its attached skin and fat in hot oil. During the cooking, some of the fat renders off, leaving behind a crusty mahogany crunch that harkens an alliance between bacon and chicharrones. Imagine a whole, deep-fried pork belly done in this manner, and you get the idea of its inherent decadence. The hunk is lifted out, cooled slightly, and then hacked up into fingertip-sized fragments before being tossed with a liberal squeeze of citrus juice, diced fresh ginger, a few bits of onion and peppers for color. Then you eat. And you eat. And you eat, until there is no more. If you are prone to addiction, or even if you are not, you will be addicted. Why? Eventhough sisig is made of 99% pork, thanks to the sourness of the citrus and the refreshing bite of the ginger, it is extraordinarily light on the palate. You never get sick of it. Since its richness never becomes cloying, you end up gorging on the sisig with careless and unchecked abandon; until before you know it, you start looking a little like a pig yourself. I totally agree that sisig is a great dish to savor. Unfortunately because of some health concerns I can't have it whenever I want to. Once in 3 months, may be. Last year we went to Native Land after being away for so many years. Of course, pork pork pork was the menu for everyday. And yes, SISIG, oh my. We had to extend our stay for two weeks just so hubby could recover from a very painful bout with gout! Why are good food almost forbidden all the time? I love sisig! Never heard of it without all the fun head stuff, though. I'd be open to trying this version, though. I like crispy pata, too. But I can only have a little bit of meat at a time, or I feel queasy. Oh. I made my blog private. Hope you got the invite. Wow..sisig. I have to try that. I had been to Magic Wok a few times now and I love their crispy pata and their chicken adobo. You might as well as add Cerritos as honorary OC city because Salo Salo Grill and Chow King are located closed by too! Oh my...Sisig is to die for. Unfortunately, if I eat too much that is probably what will happen to me! You have been raving about this but for some strange reasons I have not had sisig from Magic Wok. *confused* It has always been their pancit or crispy pata. I must include this in our order list next time. If this doesn't get me to Magic Wok I don't know what will! Also, I'm not sure if it can be truly a sisig if there aren't at least ears and snout in it. I've actually had sisig! I have a friend from the Philippines who had her baby shower and wedding catered with Philippine food and it was there both times. Now there were a couple of other things they served that I didn't like so much. Like chicken adidas. Meh. Not sure what a lot of other stuff was. For someone like me who has a Pork Gene, that dish sounds like heaven! Gonna have to make a trip to Artesia for some Sisig! You really need to take me one of these days. You've been teasing me with this place for years! Sisig isn't available up here in the Twin Cities, at least not to my knowledge. How's it compare to Chinese roast pork? I've had many different versions of Sisig. Magic Wok's is actually the lazy man's Sisig, in that it's easy to prepare by using yesterday's left over Lechon (roast pig). Not that this is not a good or acceptable way (I like this version too). Many like the so-called authentic version of pig-head parts. There is a semi-new place in the same area, Gerry's Grill, that serves a good Sisig with some of those parts (pig's ear, as well as lechon). Basically, it's good. But I felt the need to ask for extra lemon and some hot sauce to make it really good. It's worth a try if you are a Sisig aficionado. And as always with Filipino food, have a good dose of Lipitor for dessert (save the rebuttal...I'm Filipino). There is a semi-new place in the same area, Gerry's Grill, that serves a good Sisig with some of those parts (pig's ear, as well as lechon). Basically, it's good. But I felt the need to ask for extra lemon and some hot sauce to make it really good. this is true or request for fried egg over it (yup add in more cholesterol) or Knorr Seasoning. Pinoy Bistro has really good sisig as well. Request that it be toasted more for that crunch and they put jalapeño peppers for the heat. 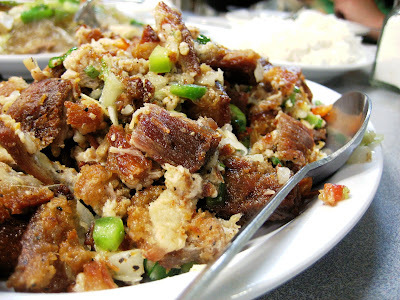 great post on sisig! one of my fave party foods! Thanks raissa. I forgot to mention the egg on top in my original Gerry’s Grill Post. Agreed, it makes it more tastier. Although one time I ordered it with egg (which by the way you need to tell your server to add since it is not mentioned in the menu), the sizzling platter that the Sisig usually comes out in, was not sizzling enough, so the raw egg did not cook thru when we mixed it into the dish. Needless to say, they took it back and we got a ‘hot’ dish, so no worries. I’ll have to try Pinoy Bistro. I always see the place when we leave Salo-Salo which by the way has another version of Sisig (I think it’s sliced char-grilled pork bellies). I like it too - sour and spicy with vinegar base sauce and hot peppers. I must say, Sisig is one of my all time favorite Flip foods. I’ve had it ever where I could find it. It comes in so many different interpretations. I think the best I’ve ever had, was in a resto in Market-Market, Fort Bonafacio Global City, Philippines, a resto called Trellis. Gerry’s Grill in the Philippines is known for Sisig, it’s their specialty. But the Trellis is my most favorite. The sisig at Pinoy Bistro has the snout and ears part so its crunchy. ☺ and though I am not a fan of spicy food, I will tolerate the heat of their sisig. Just eat it with tons of garlic rice. I think they also put "siling labuyo" or the small peppers to it so it really is spicy. I like the sisig at Salo Salo as well. Sriracha eh? That's one condiment that might just put it over the edge. This place, Magic Wok, doesn't seem to stock it...but oh well. It's probably perfect as it is. I suppose it's nature's way of ensuring balance. If all good things were good for you, there wouldn' t be so many 'good' things! But you're right...if only I can have sisig everyday...I'd be in heaven...perhaps in more ways than one. I did get the invite! I've been checking in now and then to see how your boys are doing. But guess what? I'm in Bali, Indonesia right now! And I just had that roasted pig that Anthony Bourdain had on his show. Will have to post about it when I get back! Yup. And don't forget Red Ribbon and Goldilocks too! Guess who clued me in to sisig! That's right! That was you my brother! About a few years ago, I drooled a pool when I read your post on it. It's actually a very new dish for them. It just made it into their regular menu. Before, it was just on the specials board. I think you will LOVE it! True. This might not be as authentic as it could be, but man, it makes me drool just thinking about it. And I just ate. But don't you just love that they call chicken feet "adidas", like the shoe company logo!? If you eat too much of it, I think you will have the pork gene. You hooked me up with Gen Kai, I'll hook you up with some sisig...and I'll throw in some of Magic Wok's daing na bangus, ampalaya and melon drink! Maybe even another dish of pork called lechon kawale. Bring your defibrilator. It's similar...but then it's different than Chinese Roast Pork. If that is your talking about the one with the crispy skin (not cha siu)...The secret to sisig is in that dressing...and the ginger. It's counter-intuitive, but it's actually refreshing! Yep. I was going to mention it the post, but I wasn't sure. They might just use crispy pata or even lechon kawale. But it's amazing that it's even better than the first two combined! I almost tried Gerry's Grill but heard so-so reviews...so I usually just keep on driving and get me some Magic Wok. What's wrong with me?! I guess I haven't been invited to the right parties! I have to buy my sisig. Elmo - Anon here again...Like I said earlier, there are many different interpretations of this dish. In fact, putting Gerry's Grill and Magic Wok's Sisig side-by-side, you would think one was a totally different dish. Gerry's Grill chops their ingredients so finely, that it gives the Sisig an almost stuffing like consistency. So it doesn't have much of the 'crunch' that Raissa mentioned that the pig ear /snout Sisig usually have. So it's a different experience. As for Gerry's Grill being so-so, they are realtively new here (actually in their dry run opening still, almost a year now). They are not as consistent as they should be, but their dishes are generally good. If you do go and try it, also order the Tuna belly and the Pork Liempo...good stuff...most of the time. Anon - you can also request at Gerrys Grill to make the sisig more toasted. Thats what we do. Elmo - I will agree with Anon, Gerrys can still be a bit inconsistent but so far they have been good to me hahaha. the food is really good and yes the tuna belly, tuna steak and the grilled squid are so good! Now that I know what to expect, I just might try Gerry's Grill. The place does look very inviting. Not at all like a hole-in-the-wall. I've checked out some of the folks on your blogroll. Having found you first, I'm now spoiled. They do not hold a candle to your fragrant prose. Why thank you! And I love that: "fragrant prose"...you're not so bad yourself! Thank you! Come on over to www.theslackerkitchen.blogspot.com for some laughs. I love Sisig. when i was in the Philippines we always Sisig as sumsuman with RedHorse! If you're Filpino, you know how difficult it really is to perfect crispy pata (deep-fried pig trotter, and sometimes pig knuckles). At The Magic Wok, they have nailed this process to the point where it has become their absolute staple. Fresh, crunchy, nicely crisp on the outside. Tender, juicy, fatty on the inside and completely falling-off-the-bone as soon as you break into it with your fork. If I lived on the west coast, this delicacy would guarantee me high-blood pressure, clogged arteries, and a one-way ticket to my deathbed, but I would gladly let it if I knew it was one of my last meals on this earth.